The views were amazing. The room was very clean and quaint. The host and all the staff were super helpful and kind. The breakfast was very good. Amazing location. Imervigli is the best location on island. 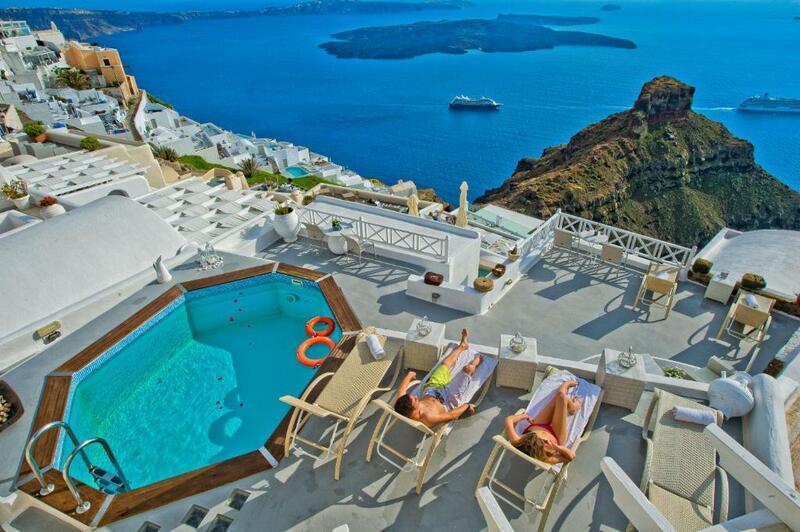 Why would you even think of staying in oia. 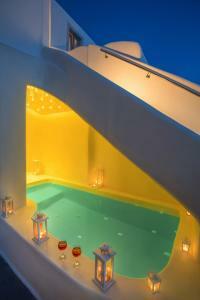 Great location away from the busy crowds of Fira. Romantic location with spectacular view. Perfect sunsets everyday. Helpful hosts who will book restaurants or tours for you. Clean rooms. Privacy. Excellent staff to carry bags. 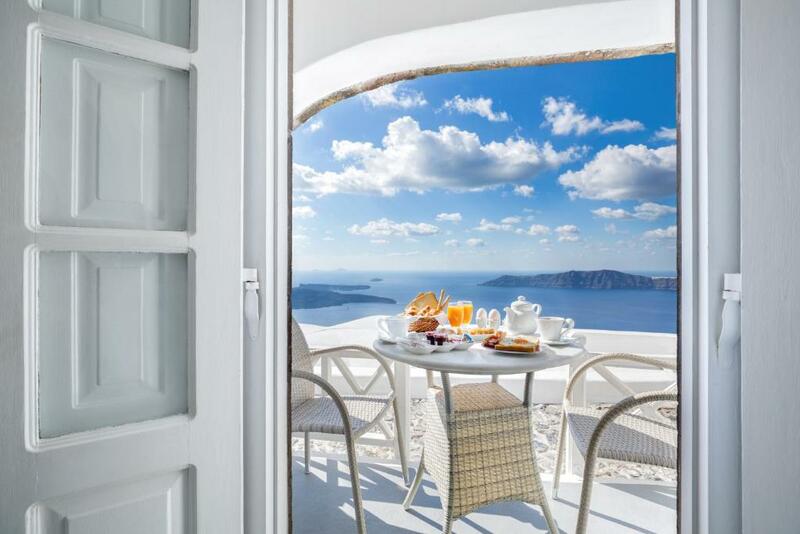 Great breakfast every morning on your balcony. Nice little pool with sitting area. Can't say enough. Close to good restaurants. Highly recommend this hotel. Amazing Caldera view from the room we had, the cave suite with hot tube. Perfect service room, breakfast and wine to the sunset view every day. The staff is also amazing in this place and the owner makes you feel at home, she is incredible and lovely. The hotel was perfect for us. It was safe, quiet, peaceful and the staff were helpful and friendly. The hosts for Thea apartments we so helpful, pleasant & accomodating. Everything was amazing! The sunsets were amazing! Breakfast overlooking most amazing view! Peaceful area of Imerovigli. 25 minutes walk from Fira down beautiful path. Helpful front desk. Lock in a great price for Thea Apartments – rated 9.5 by recent guests! 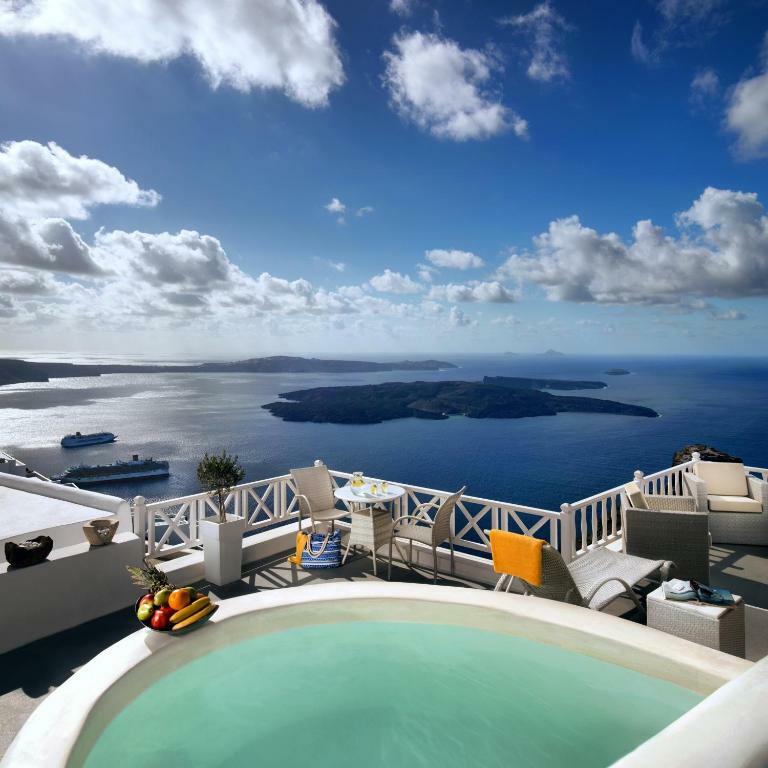 Located in the scenic Imerovigli, Thea Apartments features a swimming pool with a shared terrace enjoying panoramic views over the caldera and the volcano. It offers traditional accommodations with free Wi-Fi and kitchenette facilities. Thea studios, suites and apartments feature arched walls and built-in beds, and some enjoy views over the Aegean Sea. They are equipped with an electric kettle and mini fridge, while free toiletries and a hairdryer can be found in the private bathroom. Fira, the lively capital of Santorini, is 1.2 mi away and Oia, famous for its spectacular sunset views, is at 8.1 mi. Free parking can be found near the premises. When would you like to stay at Thea Apartments? Air-conditioned studio with a flat-screen TV, a mini fridge and a private bathroom with shower, hairdryer and free toiletries. 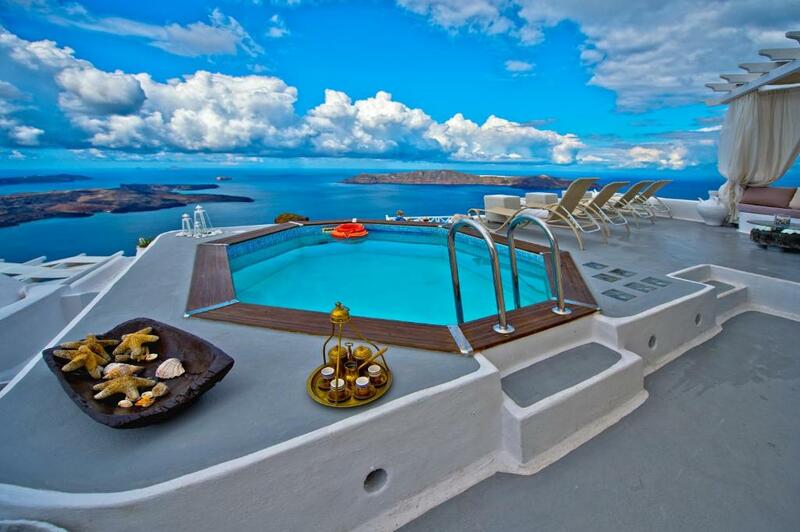 It opens to a private elevated terrace with Caldera views. Please note that this room type cannot accommodate any extra beds, only a baby cot. 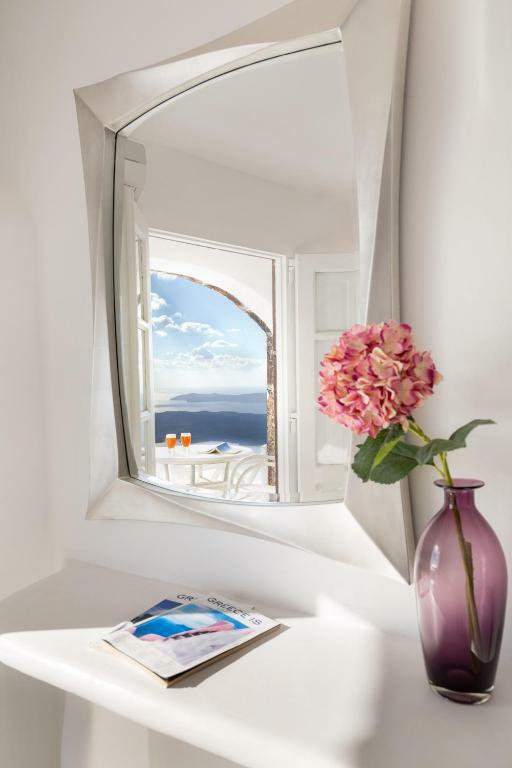 Features a living room and a kitchenette, this apartment opens out to a balcony with access to the hotel's terrace overlooking the Caldera and the Aegean Sea. 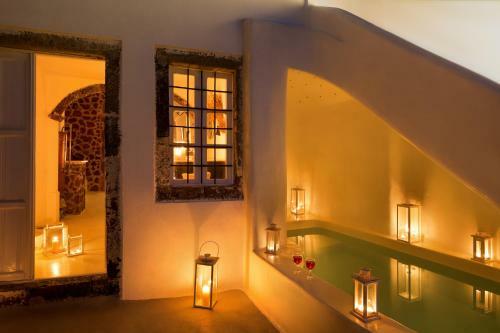 Featuring a hot tub, Caldera view and modern decor, this cave-style suite has a separate bedroom, a kitchenette, bathroom with built-in shower and a veranda. 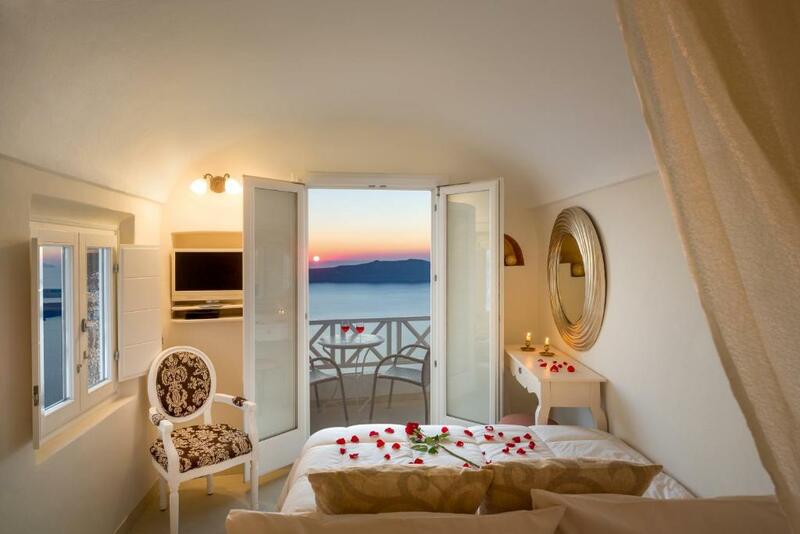 Featuring a private balcony with sunset views over the Caldera, this suite includes a kitchenette, living room and a terrace with seating area. Offering a hot tub and Caldera view this air-conditioned suite comes with a seating area with flat-screen TV. It has a mini fridge and free WiFi. This studio features views of the Caldera. It includes a satellite TV, sofa and air conditioning. Αυτό το γοητευτικό ξενοδοχείο βρίσκεται σε εντυπωσιακή τοποθεσία 300μ. πάνω από την καλντέρα, στο περίφημο χωριό Ημεροβίγλι. Χτισμένο σύμφωνα με την παραδοσιακή κυκλαδίτικη αρχιτεκτονική, η κατάλευκη διαθέτει μαγευτική θέα στο ηφαίστειο και στο Αιγαίο. Απολαύστε το ποτό σας στην ιδιωτική σας βεράντα θαυμάζοντας την εντυπωσιακή θέα. Η μικρή και ζεστή αυτή βίλα είναι το ιδανικό μέρος για χαλάρωση και ξέγνοιαστες διακοπές. Στοχο μας, να νοιωσετε σαν το σπιτι σας!! Το Ημεροβίγλι με την ονειρεμένη θέα είναι κτισμένο στο υψηλότερο σημείο των βράχων, σε υψόμετρο 300 μ. Βρίσκεται ανάμεσα στα Φηρά και την Οία. Απέχει ένα μόνο χιλιόμετρο από το Φηροστεφάνι, την τελευταία γειτονιά των Φηρών. Είναι ένας πανέμορφος γραφικός οικισμός, με χαρακτήρα καθαρά κυκλαδίτικο, που έχει χαρακτηριστεί διατηρητέος. Κατά την παραμονή σας στο τραγουδισμένο Ημεροβίγλι, θα απολαύσετε τη βόλτα στα στενά δρομάκια του, θα θαυμάσετε την παραδοσιακή αρχιτεκτονική των κατοικιών και των εκκλησιών, θα απολαύσετε τη θέα στη καλντέρα και στο ηφαίστειο, και θα γεμίσετε το άλμπουμ των διακοπών σας με μοναδικές φωτογραφίες. Επίσης, θα δείτε τα ερείπια του ενετικού κάστρου «Σκάρος» που έκτισε ο Μάρκος Σανούδος σε μια ειδυλλιακή τοποθεσία και λειτουργούσε ως παρατηρητήριο την εποχή της ενετοκρατίας. Το κάστρο αυτό καταστράφηκε από σεισμό το 1817. Ακολουθώντας το μονοπάτι που ξεκινάει από το Σκάρο θα φτάσετε στο εκκλησάκι της Θεοσκέπαστης. Είναι κτισμένο στην άκρη ενός βράχου και διαθέτει μοναδική θέα προς τα ηφαιστειογενή νησάκια Παλιά και Νέα Καμένη. Επισκεφθείτε την εκκλησία του Αγίου Γεωργίου και το επιβλητικό μοναστήρι του Αγίου Νικολάου. House Rules Thea Apartments takes special requests – add in the next step! Thea Apartments accepts these cards and reserves the right to temporarily hold an amount prior to arrival. Please note that children should be supervise at all times. Please inform Thea Apartments of your expected arrival time in advance. You can use the Special Requests box when booking, or contact the property directly using the contact details in your confirmation. The shower does not stay hot long enough for two people to shower. The bed was kind of hard. There was no coffee machine. Nothing - don't hesitate - stay here it's wonderful! Ava greeted us off the bus which she organized prior to our arrival - I highly recommend using their shuttle as the Santorini pier is a mess and a nightmare to navigate! All the staff were friendly and willing to help with everything. The rooms are divine and without a doubt the best view on the island! Breakfast was outstanding and very generous. 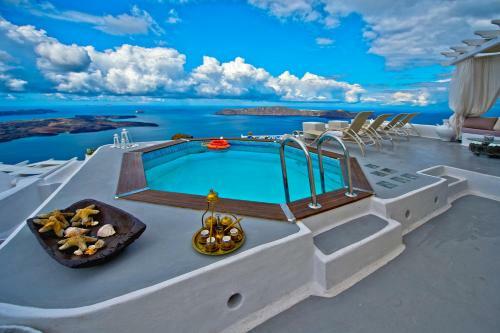 Santorini is very expensive but compared to other places with great views these apartments were comparatively good value. Excellent location, very friendly and helpful people. I will definitely recommend to friends. 2 days we found cockroaches in the room, hot breakfast was cold by the time it arrived, our car was damaged on the street parking nearby, shower buttons were loose and rusty. Hot tub was cold one night. Not sure it was worth nearly £250 per night. We paid quite a bit to have the private jacuzzi; however, it wasn’t working for half of our stay. The uniqueness and the location! Breakfast was excellent and the view was 10/10. Host was very helpful! The staff are really really helpful and attend to every single thing you need with no hassle . The room is spotless every day . The breakfast was amazing and location was A star would recommend this to anyone . The Views from the room are amazing and watching the sunset on the balcony is breathtaking! My pillow...too puffy for me. This is a general comment about the towns/villages on the caldera side (not a complaint about Thea apartments! ): if you like peace and quiet you need to be aware that the hotels and apartments in this area are all clustered very close together on the caldera edge. This fine if those staying around you are quiet (and generally this was the case), but if you get people who are maybe not so sensitive to those around them and like to have loud conversations on their phones outside rather than in their room then there is no escaping it. Our hosts were wonderful - so friendly and helpful. Anna came by the evenings we were there with wine and snacks for us, which was a really nice touch. Eva on the front desk was brilliant, recommending places for us to go and booking restaurants for us. All the staff were lovely and there are many more expensive establishments who could take a lesson from them in customer service. The lady who cleaned our apartment every day was amazing; never have I seen such spotless cleaning and tidying. 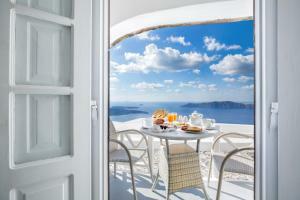 The apartments are beautiful and very individual, with fantastic views over the caldera. This is really a place to sit and take in the views from the comfort of your own apartment. Room 6 had a amazing private terrace, great view to watch the sunset a little overlooked. Views from our room were fabulous. Room was huge and great size bathroom. Close to restaurants and supermarkets. Staff were very friendly. Excellent breakfast served on our balcony every morning. There was only one bin in the room - in the bathroom. This is minor issue easily overlooked. However one of the things I will take away form my time traveling around Greece was the hospitality we encountered at every hotel we stayed at, whether affordable or expensive. Unfortunately at Thea this level of service just didn't meet the expectations we had built up over the previous two weeks - especially when taking into account this was the most expensive accomodation we stayed in. It wasn't that the girls on the front desk were rude or unprofessional, not at all, but they just seemed on auto pilot - going through the motions and completely uninterested in going that extra mile or doing anything other than the minimum to make your stay memorable. The place is still lovely and I would recommend it but the attitude could be improved massively. The crew is very friendly & helpful. We enjoyed the stay very much. Great location, Spectacular view, Reasonable rate, Highly recommended! The view was amazing! Friendly and trouble free stay.